What's the meaning of the phrase 'Know the ropes'? To 'know the ropes' is to understand how to do something. To be acquainted with all the methods required. What's the origin of the phrase 'Know the ropes'? It seems obvious that this expression derives from the need to sailors to know how to tie knots to secure rigging on sailing boats. 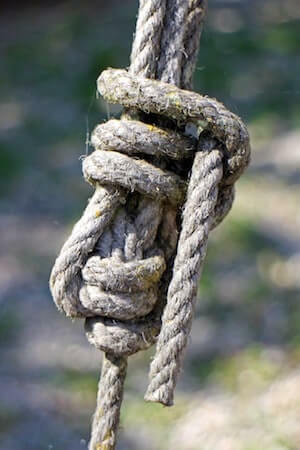 It may well have a nautical origin - sailors certainly did have to learn which rope raised which sail and also had to learn a myriad of knots. However, there is also a suggestion that it comes from the world of the theatre, where ropes are also used, to raise scenery etc. I am a stranger and... I beg you to show me how I ought to proceed... You know the ropes and can give me good advice. "The captain, who had been on the coast before and 'knew the ropes,' took the steering oar"
That clearly has a seafaring connection, although it appears to be using the figurative meaning of the phrase, that is, 'the captain was knowledgeable', but without any specific allusion to ropes. "The belle of two weeks standing, who has 'learned the ropes'." So, in what context trainees first we required to 'learn the ropes' we can't be certain. The nautical derivation seems more attractive and convincing, but the jury has to remain out on this one.